Look at his little hands! Asthma, skin and respiratory allergies have exploded throughout the industrial world. Ranging from mild to serious, these types of diseases are huge drains on the resources and medical systems of first world nations. Sufferers are forced to live in ultra sterilized environments depending on the seriousness of their allergy. So you’d think the developing world with its unsanitary conditions that poor people live in every day would be awash with these immune overreactions. They’re not! The third world has maintained a low level of allergic reaction cases for decades. While in America Mrs Smith sues her school to make sure her little snowflake is studying hard in a peanut free zone, kids in the third world are devouring any nuts they can find! So why is there such a difference between the amount of people that suffer from allergies in the third world and the first world? Recent studies have shown that it is our Western lifestyles. Take Germany, it was separated into East and West after World War II until reunification in the 90s. Studies done in Germany showed that even though the two countries had similar diets (German sausage), and cultural habits, (dancing in lederhosen) the allergy rates in West Germany were much higher than in the East. This is the opposite of what you’d expect since in the East more people lived in, “dirty” rural areas and those who lived in the cities lived in highly polluted, low sanitation, urban communist “utopias”. The same thing applies in India. India has a fast emerging middle class. As the Indian families leave the slums and live cleaner western lifestyles their astma/allergy rates skyrocket even though they live in the same city as millions of their poor country men whose kids play in the open sewers. Lose weight with Tape Worms! Recently part of the problem has been discovered. In Vietnam aid groups noticed that children had high instances of hookworm or gut worm. 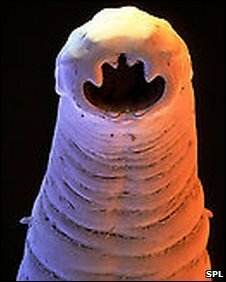 The aid groups started handing out deworming pills and soon kids all over Vietnam were living lives were they didn’t have to fear giant worms coming out of their asses. But medical groups noticed that these same kids had an increased rate of allergy attacks to seasonal or house allergens. It appears that evolution has taken into factor a number of parasites sucking the life out of our bodies and ratcheted up the immune response because we evolved with everyone being infected with parasites who did something to our immune response so out bodies wouldn’t attack them and they’d have a place warm to stay. The worms themselves aren’t the whole problem and we shouldn’t start eating dog feces in hopes of getting a slimy new friend in our long intestine but it’s definitely a sign. We are leading lives that are too clean! I remember going to an office seminar on work health. The speaker advocated washing your hands with soap for 5min every time you went to the bathroom! Now don’t go out licking subway hand holds or sleeping bums but keep in mind that your immune system is something that should be exercised, not wrapped up in a mask or in a plastic and duct tape bubble! Previous Previous post: Does “Yada” mean “Dozo”? Next Next post: Is “Manga” Dangerous? I have been sayin this for years….in fact it was my excuse to avoid bathing when I was a little kid. Sadly the other Highschool kids didnt agree with me.